These are simple, fun, fairly quick to put together (bar over night drying time) and look stunning. Best of all you can make them virtually any size you wish. We chose a dinner plate as our template and cut this from sturdy card and removed the inner circle also. We used bow tie pasta, macaroni and twists, but you could use any shapes you have in the pantry. Choose strong, clear drying glue for this part. Have fun getting messy with all of that sticky glue. We let ours dry overnight just to be certain everything was well and truly stuck down. B sprayed them with gorgeous gold spray paint. It's so shiny and sparkly, a real christmas colour that's for sure. Once the paint has dryed, glue on some decorations. We used old ones that were already beginning to fall apart, they were perfect for this. And enjoy the masterpieces. We actually did these last year. The kids just found them whilst rummaging in one of Christmas tubs so I thought I'd share them as they really do look fabulous. Don't forget to link up your Christmas Fun activities, recipes, traditions and crafts. Thanks for your comment on my blog. What a great Christmas activity resource! Love your wreath!! I agree, an easy craft that looks stunning! I had forgotten about doing this (Iused to make picture frames each year with my class for the Dad's like this)......thanks heaps for the reminder :-) They look AMAZING!!!! This is great. 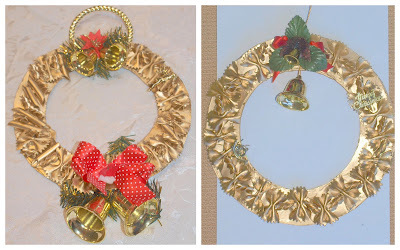 We did something like this over the summer on plain paper, but what a fun idea with the gold spray paint. Thanks. Love the wreaths. Shiny and bright - just like Christmas. I have made these in the past and glued down old jigsaw paper puzzle pieces and then sprayed them green or gold. Don't throw away those puzzles with missing pieces! These are great Kylie! I love this idea and maybe I will have to make these with my children for Christmas presents to the grandparents! thanks for sharing! PS: I clicked a vote for you the Picket Fence today! I love all the wonderful ideas you post! Thanks! Very cute wreaths. Great idea to use pasta, as it makes it so tactile for children to touch and see. Thanks for this neat project idea. You surprised me with the gold paint. I was expecting green. They are very flashy wreathes!